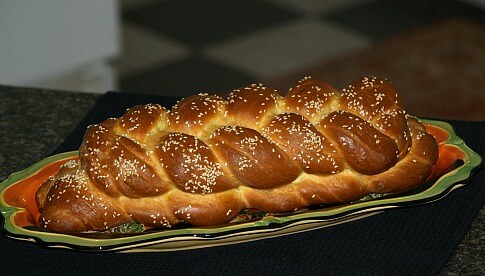 Learn how to make a challah bread recipe. 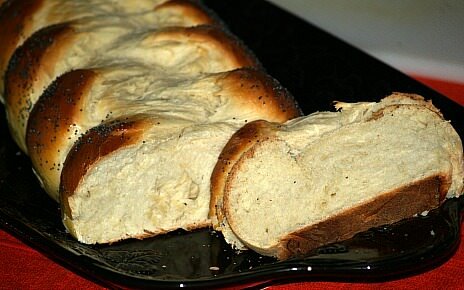 It is a traditional Jewish bread and has been baked for many centuries among the people. 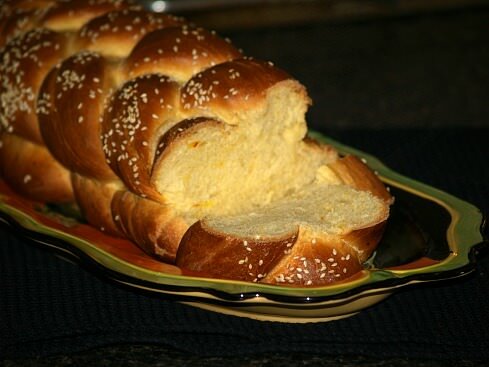 It is light and fluffy braided yeast egg bread. It is served for the three Sabbath meals beginning Friday evening, Saturday noon and again on Saturday evening with each meal beginning with two loaves. 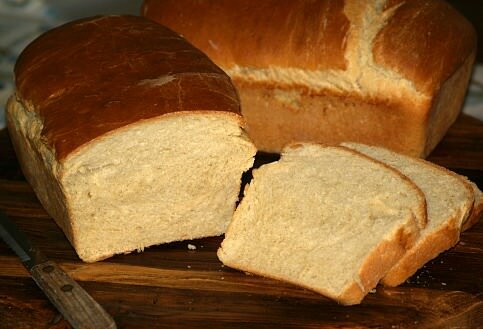 Traditionally each loaf is made up of six strands of dough which are woven together. 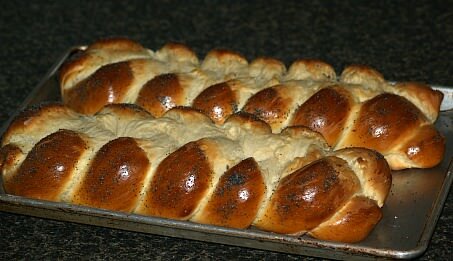 Not being familiar with Jewish traditions, I am not accustomed to the meaning behind the making of this bread. 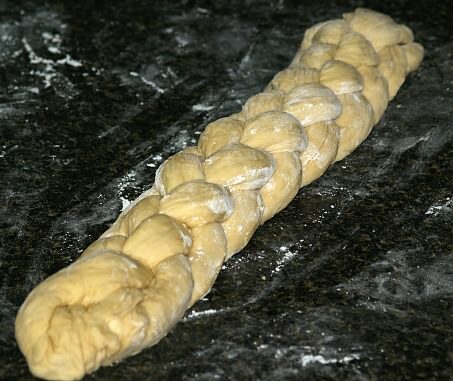 I have seen people make it with three strands, some with four strands and some with six strands of dough. 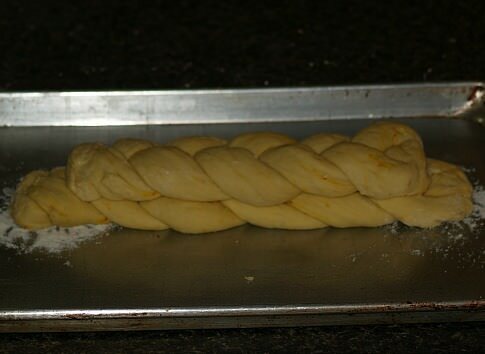 The three strands that I have seen were braided and placed on the baking sheet. Three more strands were braided and placed on top of the first. Another loaf was made just like the first one. When learning how to make challah bread recipe, you will let these loaves stand until the loaves rise to double in bulk and then they are baked. Together the two of these loaves will contain a total of twelve strands of the dough representing the twelve tribes of Israel. 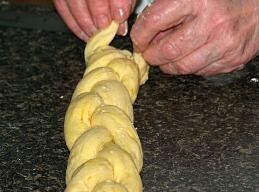 Learn how to make this challah bread recipe with six ropes of dough. Dissolve the yeast in the 1 ½ cups of water in a large bowl; let stand about 10 minutes until bubbly. Stir in salt, ADD yellow food coloring (if desired) and honey; add 2 ½ cups flour and with a wooden spoon beat until smooth and elastic and pulls away from the bowl. Beat in the butter and add the eggs one at a time; beat well after each. Stir in 2 ½ cups of more flour; one cup at a time to make a soft dough. Turn dough out onto a floured board and knead until smooth and elastic. 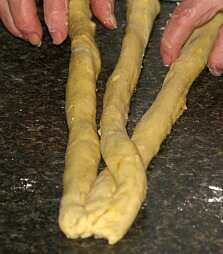 Place dough into a well greased bowl and turn so as to grease all sides of dough. Punch down the dough and divide in half. Divide each half into three parts. Roll each piece into ropes about 14 inches long. 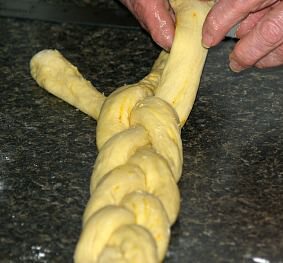 Pinch tops of each three pieces together, braid and then pinch ends together. 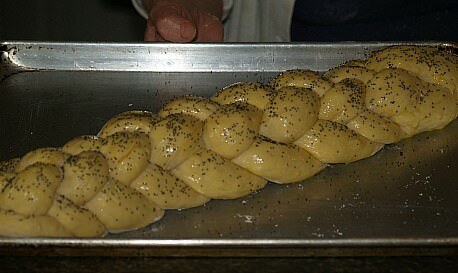 Place braided loaves several inched apart on a greased baking sheet. Cover lightly and let rise in a warm place for about 30 minutes. Beat the yolk with the one tablespoon of water. 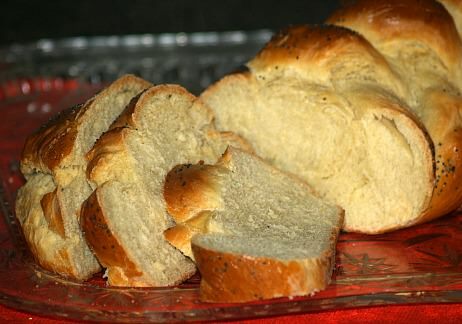 Brush mixture lightly over the loaves and then sprinkle with the poppy seeds. Bake for 30 to 35 minutes or until the loaves are brown and sound hollow when tapped. 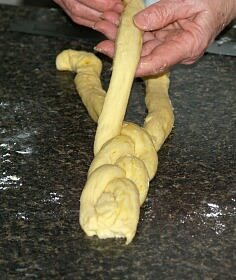 Divide dough in 6 equal parts and roll each part into a rope about 19 inches long. Place ropes on a large flour dusted working space. Gather ropes together at top end and pinch together. NOTE: To learn, I used 6 different food colors on the tips of the ropes to keep track of the ropes. Be careful and only use a dot because it might smear. I have also practiced by cutting an old towel into 6 strips to practice. 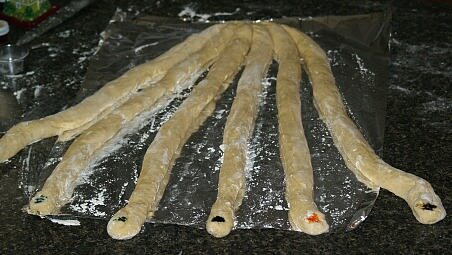 On the very ends of the dough mark the first rope on left with RED, the next with BLUE, follow with, GREEN, PURPLE, ORANGE, BROWN. START by moving RED across all ropes to the far right (Keep high and place straight out). Move BROWN across ropes to far left (Keep high and place straight out). NOW you will have 2 ropes going out and 4 ropes at bottom. Bring the RED rope down and place in middle between GREEN AND PURPLE. Bring BROWN down and place between RED AND PURPLE. Move ORANGE across ropes to the far left (Place straight out as high as possible). Bring BLUE down and place between RED AND BROWN. 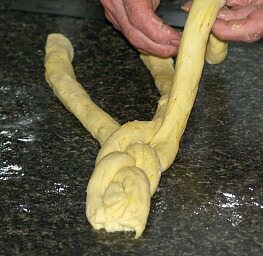 Continue this pattern until all the dough is braided; pinch the ends and tuck slightly under. 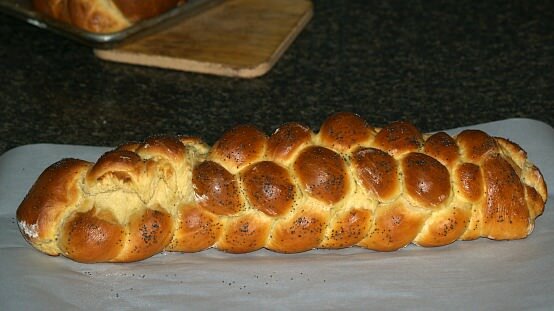 This challah bread is easy to make with no required braiding. Dissolve yeast and sugar in warm water in a large bowl; allow to stand 5 minutes. Combine and mix eggs, oil and salt; add to yeast mixture. Add flour 1 cup at a time while beating on low speed of mixer. When dough leaves sides of bowl turn out onto floured surface. Knead 15 to 20 minutes until smooth and elastic adding more flour if needed. NOTE: Dough should be rather stiff. Place dough in a greased bowl turning to coat. Cover and let rise in warm draft free place until double in size for about 55 minutes. Place dough on lightly floured surface and punch down; cover and allow to set 5 minutes. Divide dough in half; roll each half into 9 X14 rectangle. Starting at short end start rolling up jelly roll style; pinch ends to close and tuck under. 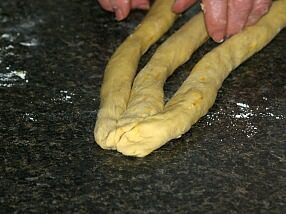 Place roll seam side down in well greased loaf pan; repeat with other half of dough. Place loaves in warm draft free place to rise until doubled in bulk for about 35 minutes. NOTE: The dough will be about even with rim of pan. Beat egg with 1 tablespoon water and brush loaves. 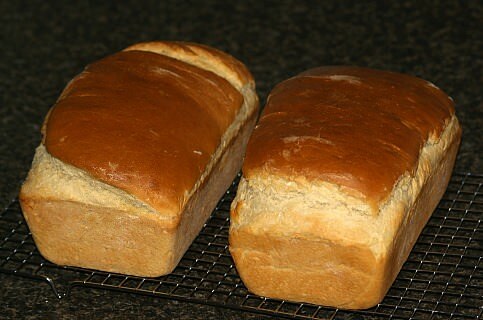 Bake about 35 minutes; bread is done when it sounds hollow when tapped. Combine milk, sugar, salt and butter in a small saucepan; heat slowly until butter melts and cool to lukewarm. Sprinkle yeast in warm water in a large bowl; stir until dissolved. Reserving 2 tablespoons of egg add eggs and milk mixture to yeast mixture; add flour. Knead dough until smooth; place in a greased bowl, cover and let rise for 1 hour. Punch down and divide into 2 parts; divide each part into 3 pieces. 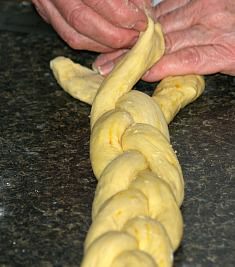 Roll each piece into a rope about 15 inches long; braid 3 ropes together (Making 2 loaves) and let rise 30 minutes. Brush loaf with reserved egg, sprinkle with poppy seeds and bake for 30 minutes. Place water in a large bowl; sprinkle yeast and 1 teaspoon sugar on top stirring to dissolve. Add butter, salt, remaining sugar and saffron to warm milk; stir until butter is melted and cool to room temperature. Beat in eggs and another cup of flour; stir in enough remaining flour to make a soft dough. Turn dough out onto a lightly floured surface and knead until smooth and elastic 8 to 10 minutes. Place dough in a greased bowl and turn to coat; cover and set in a warm place to rise about 1 hour or until double in bulk. 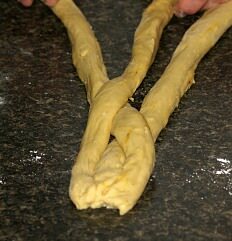 Punch down dough and divide into 2 parts (One slightly larger than the other). Cut each part of dough into 3 equal sizes. Shape 3 LARGE pieces into ropes 18 INCHES long; braid and pinch ends together, tuck ends under and lay straight on prepared sheet. Shape 3 SMALL pieces into ropes 14 INCHES long; braid and pinch ends together, tuck ends under and place on top of large braid. Brush loaf all over with egg wash; sprinkle with sesame seeds on top. 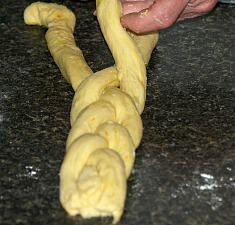 Bake 40 to 50 minutes or until braid sounds hollow when tapped. NOTE: If bread begins to brown too much, lay a piece of foil over the top to finish baking.